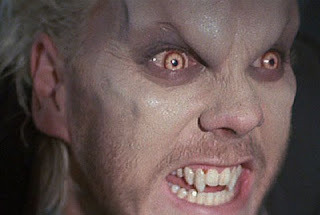 Before movie vampires were cuddly, hunky, and tragically romantic, they were pretty rotten creatures, none more so than the small colony of murderous blood suckers in The Lost Boys. These vampires have no redeeming features whatsoever, and they look fairly hideous whether in human or monster mode. With Joel Schumacher directing, Richard Donner co-producing, and a cast of characters that brought together some of the better young talent of the era, The Lost Boys is a classy tongue-in-cheek horror flick with a few good moments of humour thrown in to spice up the fun. Teenager Michael (Jason Patric) and his younger brother Sam (Corey Haim) are new arrivals to the small coastal California town of Santa Carla, where their mom Lucy (Dianne Wiest) has relocated their lives following a divorce. Beyond perpetually cheesy fairgrounds, Santa Carla has little going for it, and it loses it's minimal appeal when Michael and Sam realize that they are now in the murder capital of the country. Someone or something is committing a lot of violence in what should be a sleepy little resort community. Things brighten up momentarily when Michael meets the flirty Star (Jami Gertz); but she turns out to be just a lure to attract Michael to a group of rowdy vampires led by David (Kiefer Sutherland). The impressionable Michael shares a drink of blood and is half-way to becoming a vampire; he just needs to kill something to complete the transformation, and Sam looks like a reasonable target. Sam enlists the help of local vampire hunters Edgar (Corey Feldman) and Alan (geddit?) to fight off Michael, destroy David and his gang, and find out whether Lucy's new friend Max (Edward Herrmann), a meek but creepy video store manager, has anything to do with the local carnage. The Lost Boys brings together a talented young cast that sparkles, sometimes under heavy make-up, despite the Santa Clara darkness. Kiefer Sutherland has rarely had a better opportunity to growl and drip evil on the big screen, while the role of Sam is perfect for Corey Haim's screen persona of scrappy resourcefulness. His regular screen partner Corey Feldman is also a natural as Edgar, all fake bravado, surviving thanks to equal measures of dumb luck and misguided initiative. The Lost Boys also benefits from a sultry Jami Gertz at the peak of a career that promised much but fizzled too early. Jason Patric gets the most central role, but delivers a less interesting performance, all 1980s hair and little engagement. Dianne Wiest and Edward Herrmann add a dose of classiness to the movie. Schumacher creates an atmosphere of silly dread, never aiming to be really scary but still managing to engineer a few effectively bloody moments. The Lost Boys has no message of value, but enjoys itself all the same delivering high quality nonsensical fun.